thankfully not all is lost! 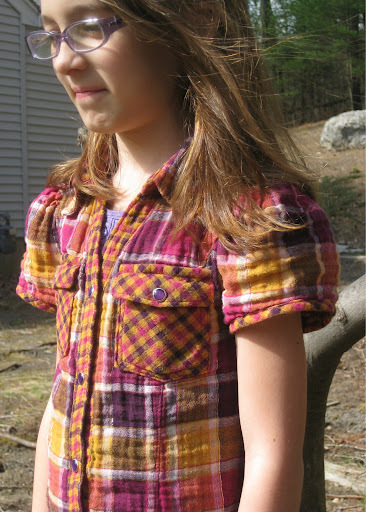 i decided not to dwell on it and just cut those suckers up and refashioned them to fit my 7 year old daughter. lucky her! these pj’s have pockets and everything. i used some pink bias tape for the pocket edge. 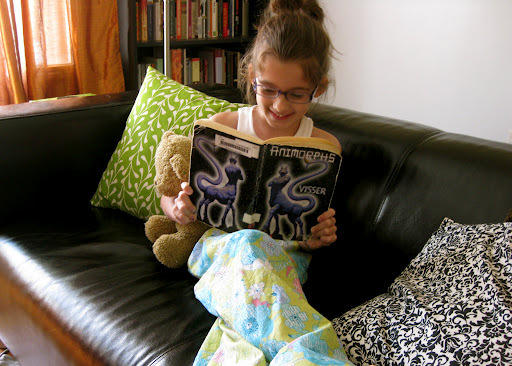 i’m so bummed they didn’t work out for me, but if you saw how excited she was to come home from school and find a new pair of pj’s… well it made it all okay in my book. i might even use the scraps to make her a matching top. 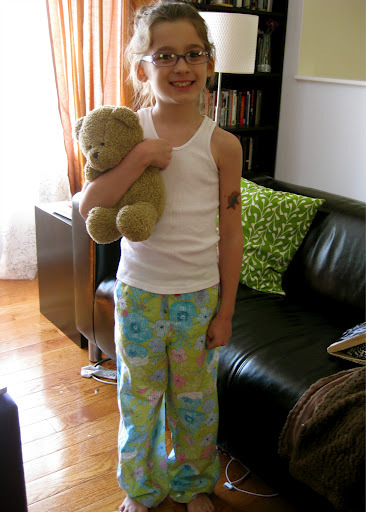 seriously, my kids get all hopped up over things like pj’s and new toothbrushes. hopefully i can take another stab at pj’s soon because i could really use a few pairs myself! anyways, i’ll be back soon with my finished eclair. i’m just waiting for a semi-warm, non-windy day so i can take some outdoor pics! okay, so who doesn’t love a dress with pockets? 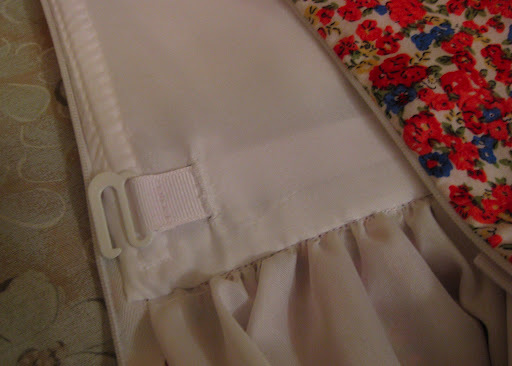 it used to take me forever to put a pocket in so i frequently skipped it, citing “bulky side seams” as my excuse. which is often valid, but the skirt of this dress (colette patterns eclair) is so voluminous and gathered that even if you screw up the pockets, it’ll probably be hidden out of sight. the left pocket provides a particular challenge in that there is also a side zip that runs into the pocket area. fortunately, the directions perfectly explain how to do this. 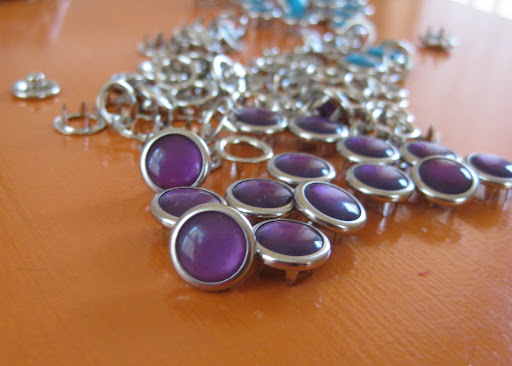 i used some very confusing directions once and i swore it was a miracle that it turned out wearable! 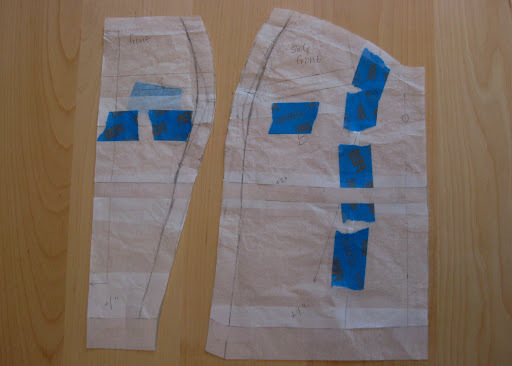 for the non-zip side i’ll show you step by step how to sew in-seam pockets so you can still press the side seam flat, as is my preference. now, fair warning—i did this a month ago so if i jump around funny and don’t make much sense… well just give me a holler. 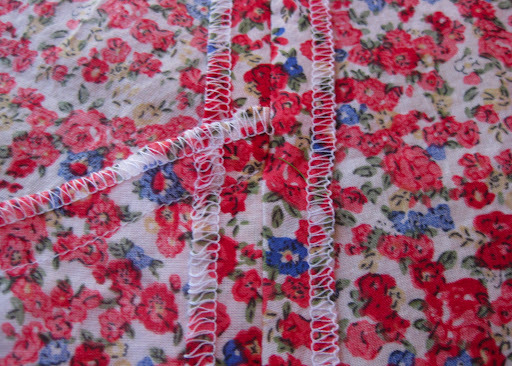 front skirt piece. sorry, you eyes work fine, this pic is just fuzzy. 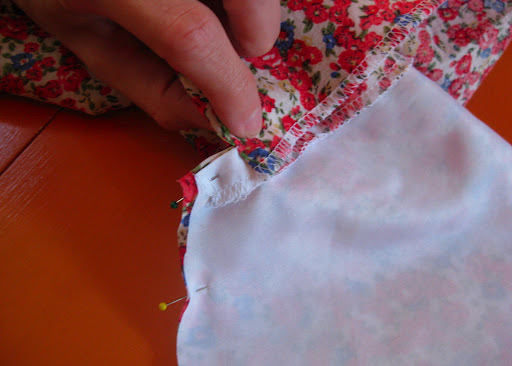 sew the pocket to the skirt piece by sewing just between the two dots. you want to leave the seam allowance of the pocket free. 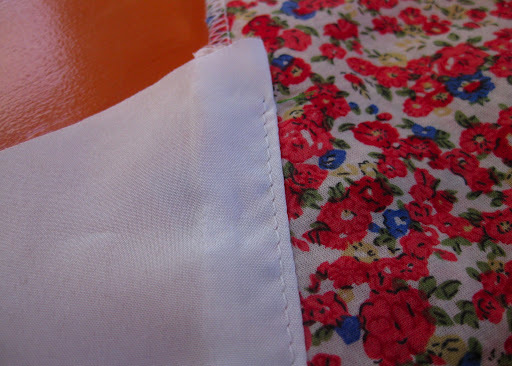 press the pockets out and understitch on the pocket bag, staying within the two dots. repeat on the other pocket piece. 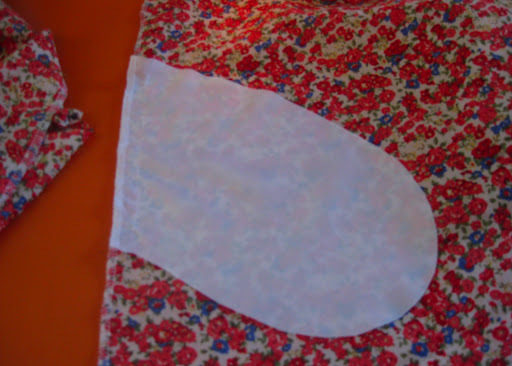 now, pin the front and back skirt pieces together lining up those dots and secure it with a pin. 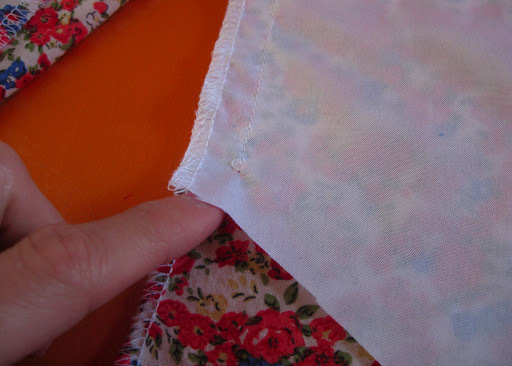 make absolutely sure your side seams where you stitched the pockets line up. continue to pin the front and back pocket pieces together. 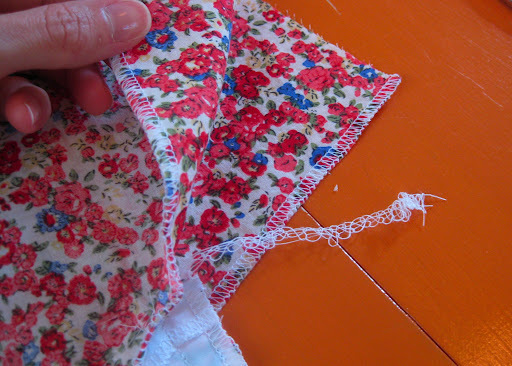 now sew around the pocket making sure to stay completely clear of the skirt pieces. once you have sewn up the pocket bag finish the seam allowance. 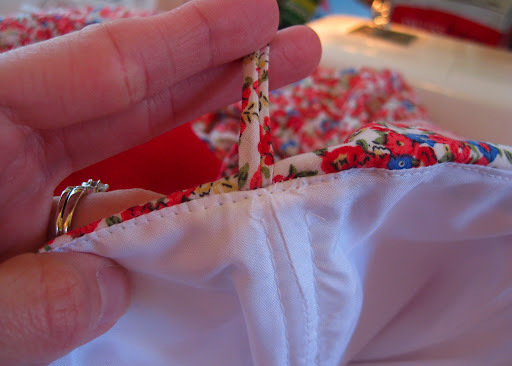 you have your pocket done, now sew up the side seam above and below the pocket opening, making sure not to catch the pocket into your stitching. and make sure you don’t sew the pocket shut. it can happen. once this is done you can press the seam open with the pocket to the front. 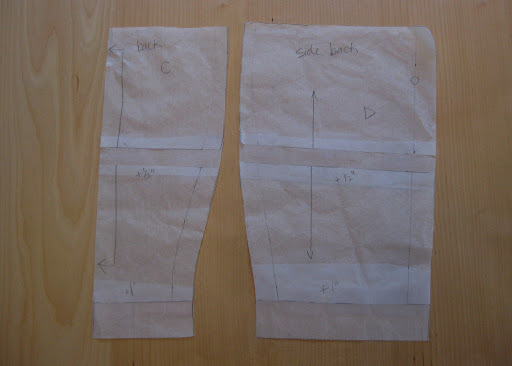 now, if you want, you can stitch or tack the pocket to the front seam allowance just so it stays to the front. totally optional, i’m pretty sure i didn’t. just thought i’d share. so there you have it. in-seam pockets are super easy and not scary at all! oh by the way, did you see the pajama party going on? yeah! count me in!!! i can announce that i’m participating because i have my pajama pants nearly done and barring some unforeseen circumstance i should totally have them finished on time. easter came and went so quickly i barely knew what was happening! i did that stupid thing i sometimes do and decide to sew outfits for all the kids for a particular event/holiday. the last time i did this was for halloween. 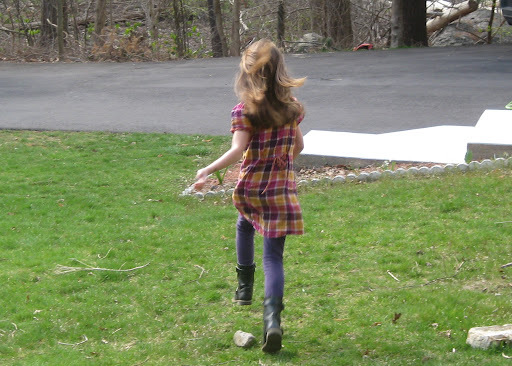 since i seriously disappointed the kids by not making them christmas outfits (or new years outfits, or valentines day outfits, or st. patrick’s day outfits, or we’re-going–to–a friend’s–house–for–some-random-occasion outfits…) i decided i could manage easter outfits. as always, time got away from me and i had to sew marathon style to deliver everything i had promised. but before i get to the kids outfits, how about a peek at mine? for christmas i received colette patterns eclair, and thought it would be a perfect for easter. since it requires a good amount of fabric, i made sure to keep an eye out for a deal and fell in love with this cute floral print. i snagged up the last few yards of it at under $4/yd!!! 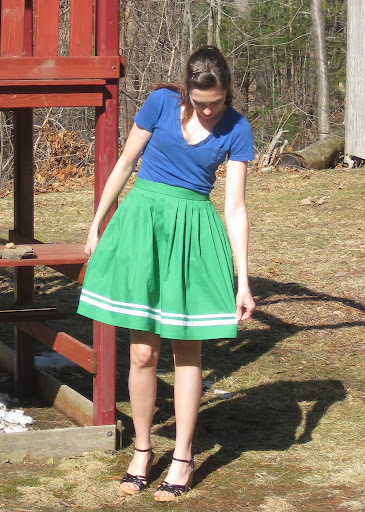 it is a cotton lawn and feels so dreamy and soft, perfect for a full-skirted spring dress. is it just me or does this fabric have something of a liberty print vibe going on? if you haven’t noticed, i’ve become something of a colette patterns junkie. they have me so spoiled with their sweet packaging and hand-holding instruction booklets. i’m one who normally skips over the pattern instructions, but from colette i read every word whether i need to or not. a benefit to sewing from the same pattern designer repeatedly is that you quickly get a feel for what adjustments you will need. i know i have to cut out basically all the bodice shaping, so that’s what i did. i finally figured out how to do sba’s on darted bodices, so the princess seams threw me for a loop initially. on this bodice, the princess seams narrow to the center more than normal, so it took a bit of fiddling to get the shaping right without losing this (slimming!) design feature. seriously. you don’t even want to know where the original seamlines were. why i don’t just start out with a rectangle and then add tiny amounts of shaping is beyond me. as a personal preference, i’m not totally comfortable in a strapless dress so i added spaghetti straps. they don’t do anything structural, i just felt like they would be a nice insurance policy on account of my lack of boobage to keep this sucker up. also, my shoulder to bust measurement is shorter than average, so i just hiked the bodice up and added some length under so that the bodice hit my waist. all in all, i added a good inch and a half to the length of the bodice because i need the waist seam to hit under my ribcage. ya know, so i can breathe and whatnot. i think this pattern is a tad short-waisted anyways, fyi. being a strapless dress, the bodice needs some solid construction to make sure everything stays in place so i underlined the bodice pieces with muslin. but, before i underlined the bodice pieces, i added some lightweight fusible to the muslin. this gave me the benefits of the fusible interfacing without having it directly applied to my shell fabric. i hate to risk the bubbling or weird creasing you can sometimes get with the fusible. yes, i could have just underlined in a heavier material, but i was using what i had on hand, and this worked out rather nicely. princess seams flat from now on! i used a lightweight poly lining to which i added boning. 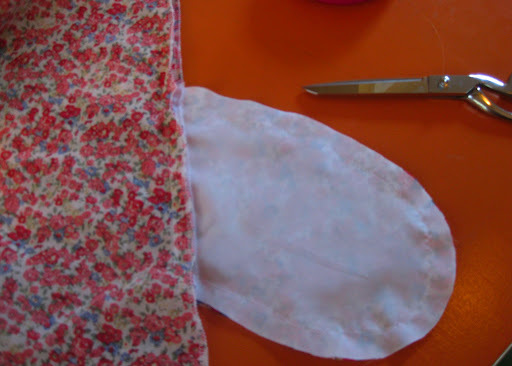 the pattern suggests a sew-in caseless boning but i went with the good ol’ roll-o-boning from joann’s. it’s not my favorite, the plastic can be a bit unruly, but it gets the job done. quick tip: bring a pot of water to a boil then shut off the heat. take the boning out of the casing and drop it in the hot water for about 5 minutes and it will magically uncurl! 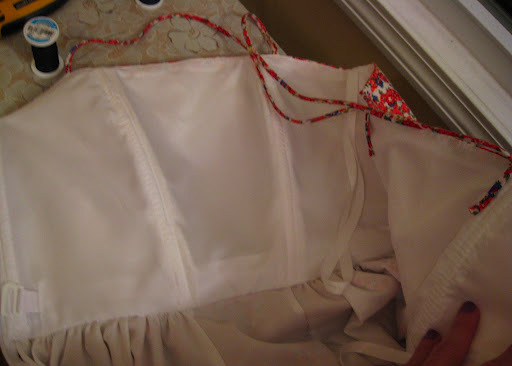 also since i was dealing with an essentially strapless bodice i added a waist stay. the waist stay helps to anchor the whole dress so i don’t feel the need to constantly tug at it. 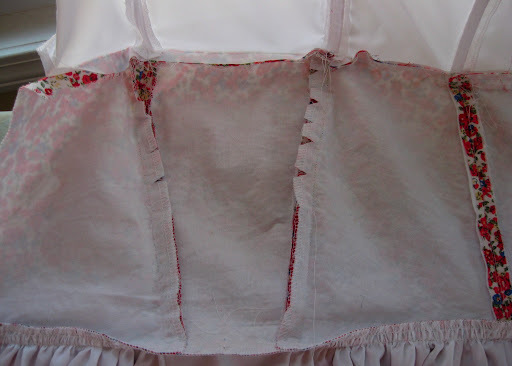 even a well fitted bodice can start slipping. as colette patterns is famous for, this dress has pockets! 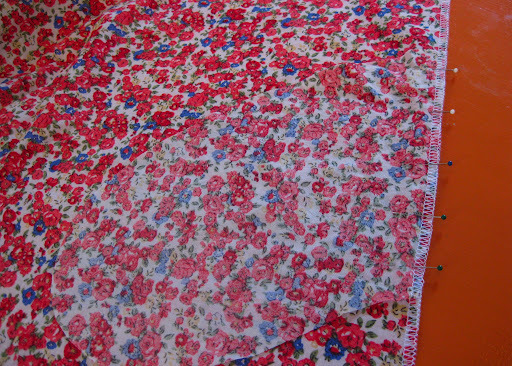 the full skirt hides them beautifully, but i strayed from the pattern directions slightly because i wanted to be able to press the skirt side seams flat. i’ll elaborate on what i mean here in my next post and give you a full step by step. mmm… don’t you just love a neatly finished interior? so i had been admiring this double sided voile shirting fabric for several months (purchased here), and when it went on sale and i had a few other fabrics i needed, i snatched up a couple yards. 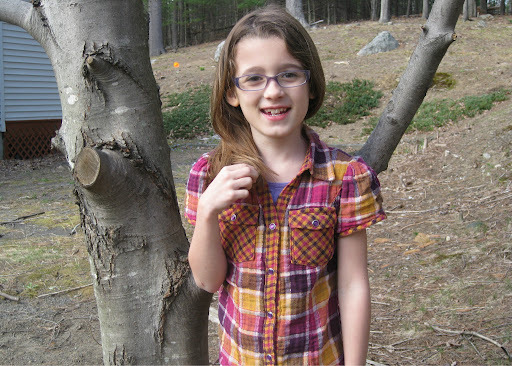 i had this cute shirtdress pattern to use for my oldest daughter (to see if i could successfully make my first proper button down and collar garment) and thought it would be perfect! i was wrong. 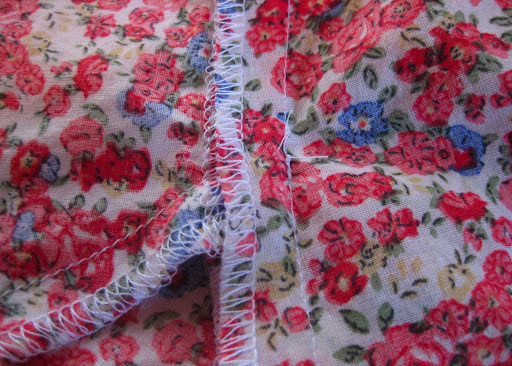 okay, i wasn’t wrong… but it was definitely not the right fabric to try a new skill on. it’s lightweight, it’s shifty—shifty i tell you!!! oh, and to top it off, it’s plaid. and it’s a princess seamed pattern. and i’m just right at this moment having a slap-palm-to-forehead revelation: why didn’t i switch the princess seams to darts? duh. 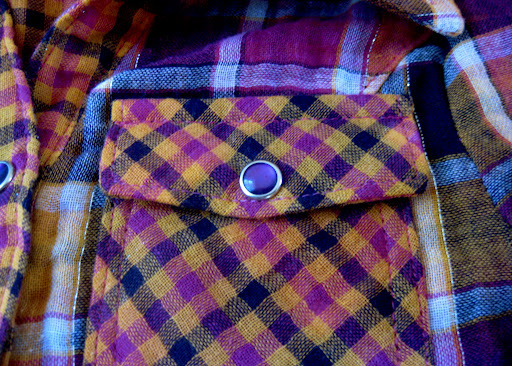 button down shirts have lots of pieces. ergo lots of plaid matching. but the fabric is so darn cute! sigh. 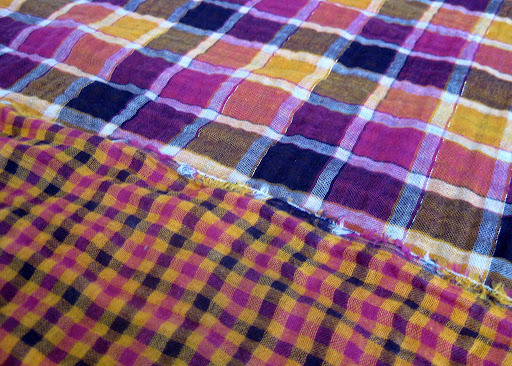 by the time i had finished cutting my pieces (one at a time because i could not line up the plaid to cut the fabric double sided—not even the folded pieces) i had already invested four or five hours. just to cut a shirtdress for a seven year old. this fabric should come with a warning label!!! but it didn’t. and i bought it having no idea what i was getting myself into. once the fabric was cut i had to set it aside for a few days to convince myself that it wasn’t really that hard to work with… argh, felt like every single seam was a struggle. it felt like i was sewing for the first time. but, i plowed ahead and sewed and topstitched, and sewed and topstitched. i wanted it to look like a real shirt, so i topstitched every seam i could! 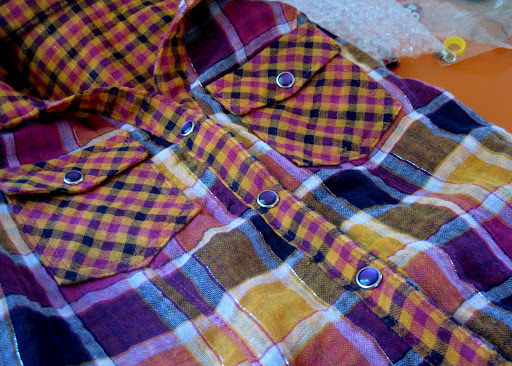 remarkably once all was sewn and done, it actually looked like… a shirt. a real shirt. but the thought of making 8 buttonholes made my head spin. also, a timely blurb on sunni’s facebook page cued me in that what i needed to finish this thing off properly were snaps. yes, those adorable pearly snaps! so, the shirt was sitting in my sewing room completely finished for over a week as i waited for my beautiful snaps to arrive. thankfully my first snap application was a huge success! they went in super fast (i think it took about 15 minutes total. take that buttonholes!) and they totally finish off the look of the shirt. dare i say, they were a snap to put in! you knew that was coming. 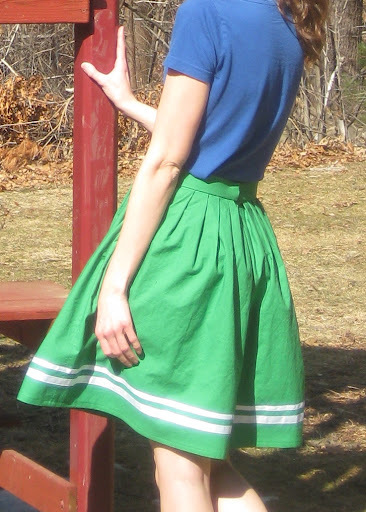 i am 95% pleased with the outcome of this shirtdress! which is high, i assure you. despite the horrifically difficult fabric i was working with (did i mention it was shifty??? ), i finished the whole thing without mishap. 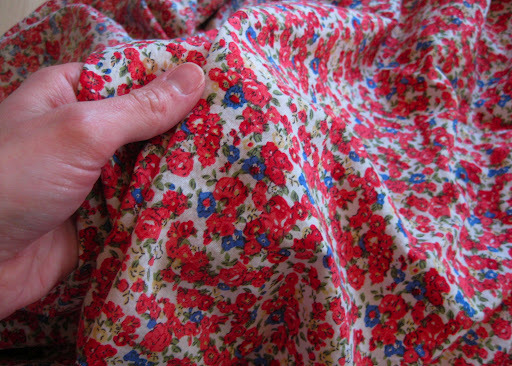 but seriously… only use this fabric if your patience is on heroic virtue levels. for real. believe me, unpicking seams with this fabric would have been nearly impossible. my button placket is passable (two piece button placket, not one of the faux just turn it to the inside button plackets, mind you) and my first real life two piece collar is very close to perfect. i won’t point out the flaw in my collar application, only someone who actually knows anything about collars would notice what’s wrong with it. i couldn’t accurately mark this fabric so something got a little off… but like i said: you will never know. 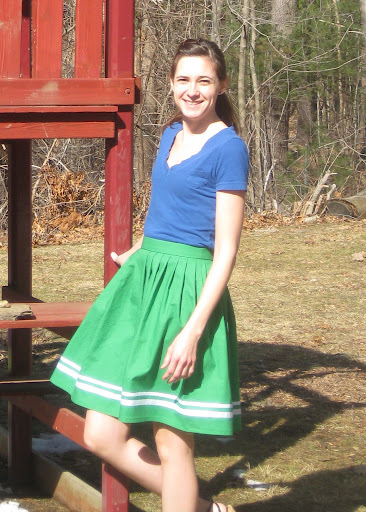 and, for your amusement… i also made this skirt. it is ridiculous and poufy and too stiff of a fabric, so i’ll probably never actually wear it. does look much cuter in pictures than in real life though, go figure!